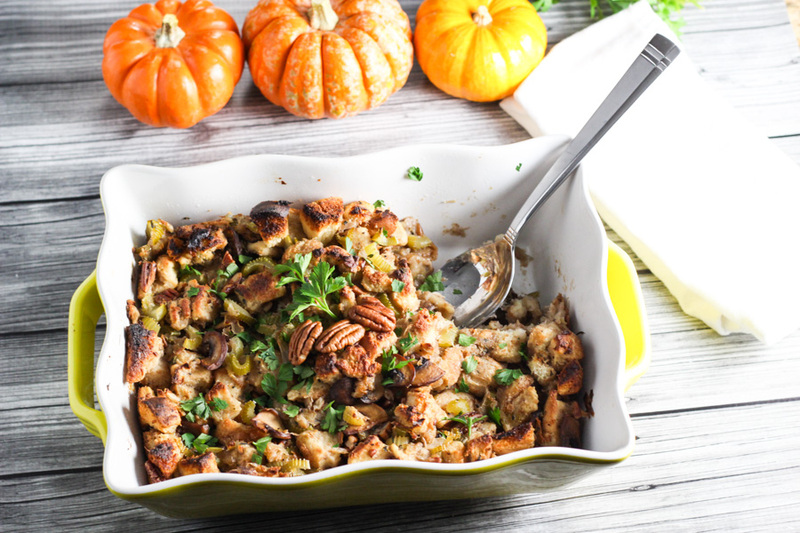 This Mushroom and Pecan Stuffing with Fresh Herbs is a family favorite recipe for Thanksgiving! Includes instructions for baking the stuffing inside or outside the turkey. 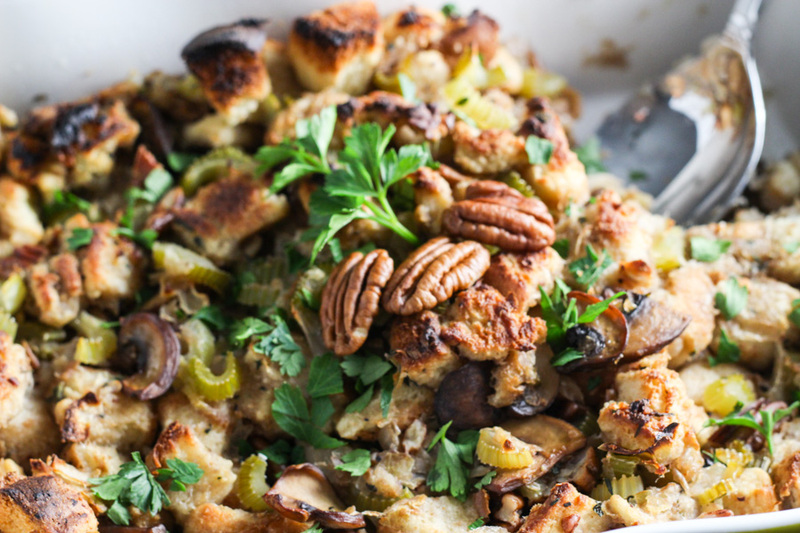 No Thanksgiving table is complete without the stuffing, right?! There are SO many variations and I’ve found that I’m not too particular. As long as they’ve got a bit of sage running through them and a good crunch, I’m all in! However, I have to say that after perfecting this recipe, I’ll be hard pressed to not make this version year after year. I love the flavor of the white wine, the flavor of the mushrooms and the added crunch from the pecans!!!! In a large skillet over medium heat, melt 2 tablespoons butter. Add the mushrooms and sautee until nicely browned. Set aside. Melt another 2 tablespoons of butter in the same skillet. Add the onion, celery, garlic, sage, thyme, nutmeg, cloves, and salt. Cook until the onion is soft, 5 to 7 minutes. Remove from the heat. In a large bowl, toss the sautéed mushrooms and vegetables with the bread cubes and chopped pecans. Season with pepper. Melt the remaining butter. Pour it over the stuffing, along with the wine, and toss to coat. The stuffing should just hold together when mounded on a spoon. If cooking in a turkey, put the stuffing in the bird just before roasting. Pack the stuffing loosely, leaving enough room to fit your whole extended hand into the bird's cavity. Cook the stuffing in the bird to 160º to 165ºF, checking with an instant-read thermometer. If the bird is done before the stuffing is, take the bird out of the oven, spoon the stuffing into a casserole dish, and continue to bake it while the turkey rests. If baking some or all of the stuffing in a casserole, pour a cup or two of stock over the stuffing to replace the juices the stuffing would have absorbed from the bird. Bake it covered until heated through, 45 minutes to 1 hour. For a crunchy top, uncover it for the last 15 minutes of baking. Top with chopped parsley.